Are you a fan of power-pop? 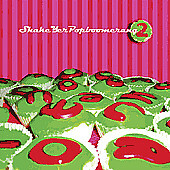 Well, if you are, you're in luck, because Shake Yer Pop Boomerang Volume 2 includes twenty-three tracks of sheer sugary, sticky-finger goodness. From the bouncy anthem by Milli Davis that would make even the luckiest man alive want to sing along and be "The Loser" for a bit. Through energetic, rocking, hook-laden number of Peabody's "You Are Her Only Friend". And including The Suits ("Girl"), Lazy Susan ("I Will"), and Go Betsy ("Boy From Canada"). This disc servers up guitar-driven power-pop that will have even the toughest of critics bouncing up and down, singing along, and admitting that this style of pop is just too happy-go-lucky to be down when you hear it. I'll give this a B.